Even if summer is not quite here yet, we are slowly taking off layers of heavy clothes - finally! - and start wearing our beautiful and colourful summer dresses and shirts. Personally I really love the off-shoulder ones, the most popular 2017 spring/summer trend, that leaves you plenty of choices when it comes to Jewellery. 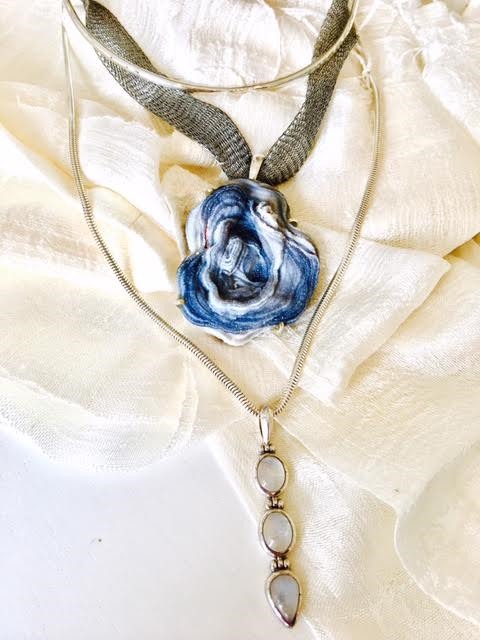 This is probably the only season in the year which allows us to show off multiple necklaces & pendants without trapping ourselves in scarves and, most important, to bring our outfit to the next level adding that special touch..let me give you some suggestions about how to MIX & MATCH wonderful necklaces/collars/pendants! Don`t be afraid of putting together different colours, designs and lengths and don`t forget to add at least two/three chains...The secret is excess! 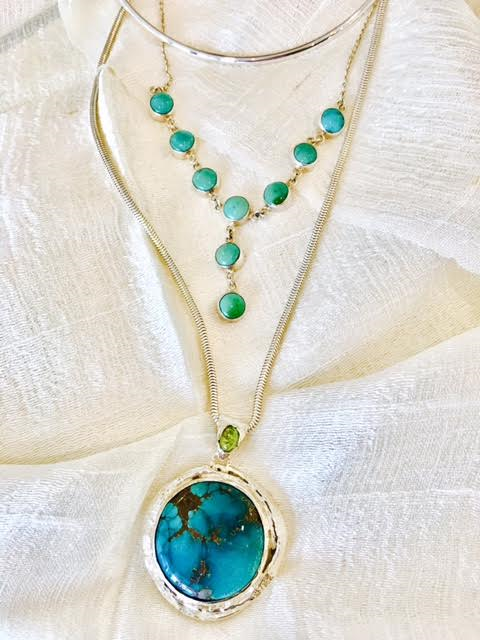 Hallmarked Sterling Silver Collar £48; Beautiful Turquoise necklace in Sterling Silver £116; Sterling Silver 24" chain £52; Stunning pendant with Turquoise & Peridot in hallmarked silver, a one-off piece £ 340. Find all the items in store. Aluminium mesh £24; Hallmarked Sterling Silver Collar £78; Wonderful Pietersite & Citrine pendant in hallmarked silver, a one-off piece £260; Sterling Silver 24" chain £52; Citrine in Sterling Silver pendant £86. 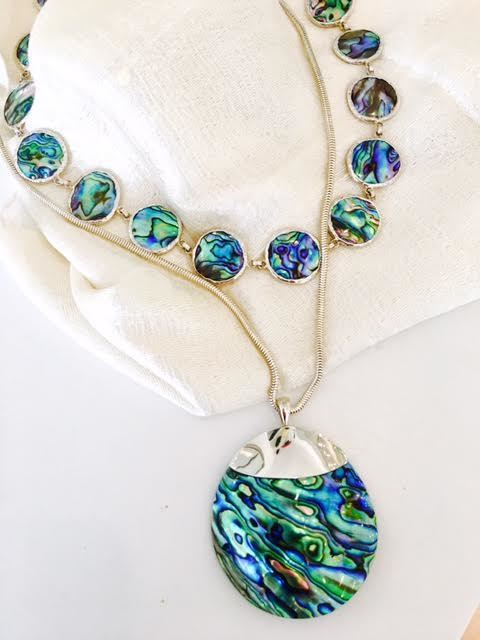 Abalone shell necklace in Sterling Silver £188; Sterling Silver 24" chain £52; Abalone pendant in Sterling Silver £56. 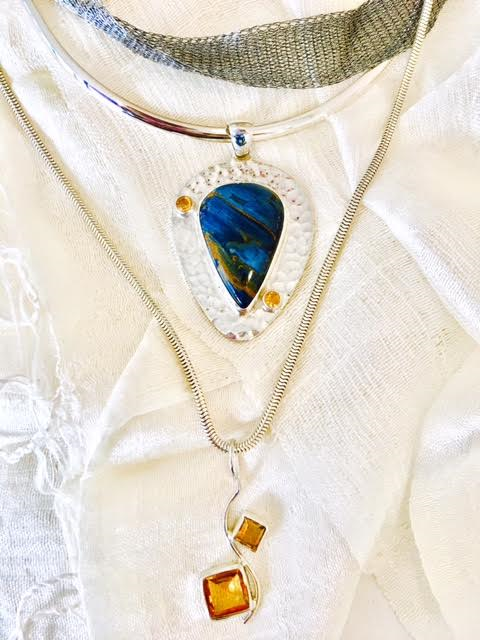 Hallmarked Sterling Silver Collar £48; Aluminium mesh £26; Superb one-off pendant with Desert Drusy in Hallmarked silver £286; Sterling Silver 24" chain £52; Moonstone & sterling silver pendant £68. Another part of our body to be in the spotlight in summertime is hands..free from gloves and winter dryness our hands really go into the foreground and become a seduction tool! We can have fun with colourful nails and we can MIX a lot of different RINGS together not being concerned about overdoing it. Try to match smaller & bigger designs of rings as well as more than two different gemstones and dress your fingers with style! 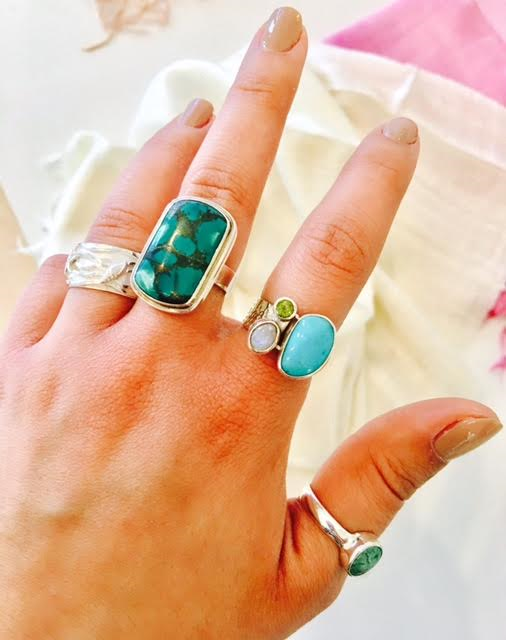 From left to right: Sterling silver wide band ring £38; Stunning Turquoise & Sterling Silver ring £ 76; Turquoise, Peridot & Moonstone St. Silver ring £ 64; Turquoise & St. Silver ring £32. 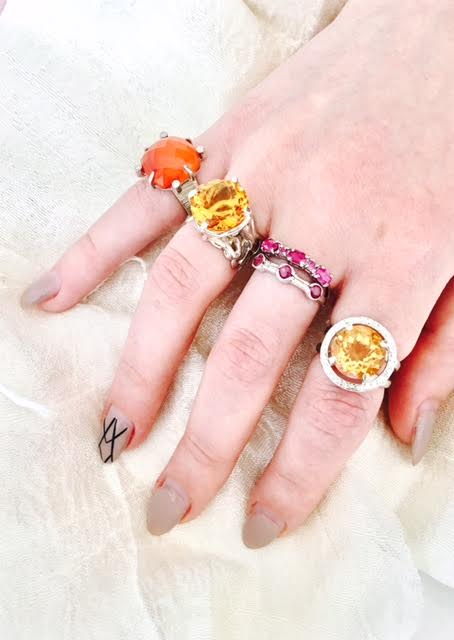 From left to right: Carnelian in hallmarked St. Silver £ 190; Wonderful Citrine in hallmarked St. Silver £280; Natural Ruby in St. Silver rings £46; Citrine & St. Silver £170. 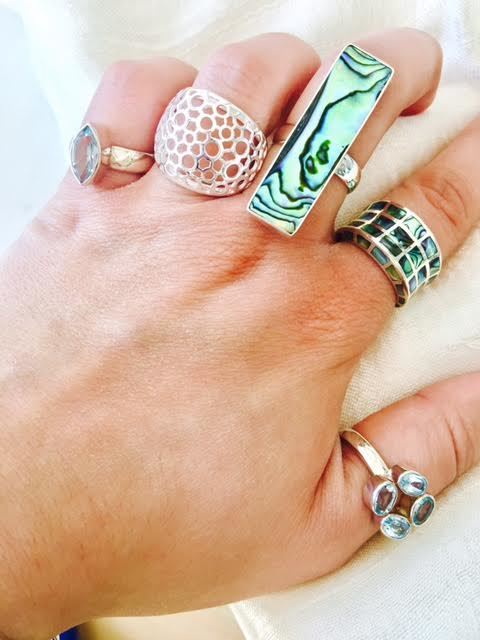 From left to right: Topaz in St. Silver £48; Honeycomb St. Silver ring £ 86; Abalone shell & St. Silver £ 78; Abalone & St. Silver £ 64; Topaz & St. Silver £68. Find all the rings in shop now! Last but not least..the wrist. 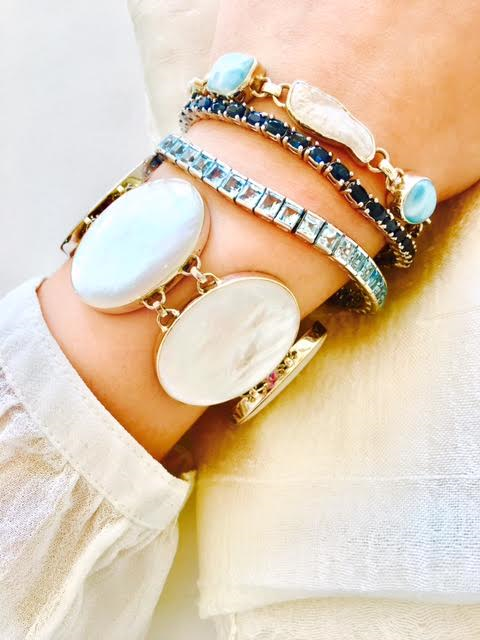 Wearing sleeveless dresses and shirts allows us to decorate our arms and wrists with beautiful BRACELETS to focus the attention on bare skin. A must have is definitely the silver bangle that you can easily mix and match with a wide range of semi-precious gemstone bracelets without going wrong. Again, the only suggestion is to have fun with colours and quantity! 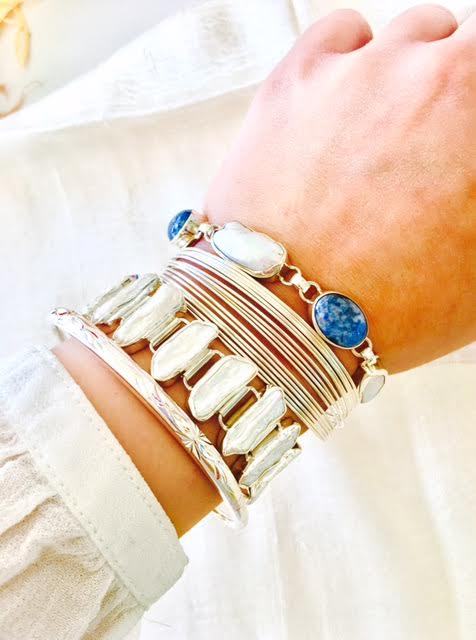 Below are some inspirations with stunning bracelets all from The Earring Collection,our boutique shop in Cowes. Come to visit us soon! From left to right; Stunning Mother of Pearl in Sterling Silver £136; Beautiful Blue Topaz in Hallmarked Silver £228; Burmese Sapphires in Hallmarked Sterling Silver £ 240; Larimar & Baroque Pearls in St. Silver £150. Citrine in Hallmarked Silver £360; Hallmarked Silver Bangle £62; Burmese Rubies in Hallmarked Silver £ 220; Sterling Silver bracelet £42. From left to right: Hallmarked Silver Bangle £68; Baroque Pearls in Sterling Silver £180; Hallmarked Silver Bangle multi £76; Lapis & Baroque Pearls in Sterling Silver £ 168. 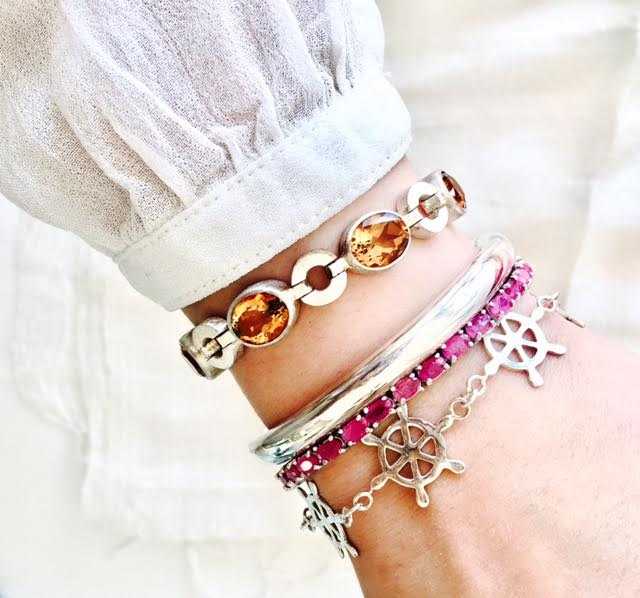 Find all the bracelets in store. Enjoy your summer in style!